This current article updates and supplements information presented in the article from October 2015. On balance, the information presented in this updated article supports the conclusion that the useful life of a utility smart meter should not be considered to exceed 10 years. Those utilities planning to deploy smart meters in the future should adjust their project plans and CBAs accordingly. As one reviews the entries above where useful lifetime values are mentioned, they vary through the range of 5 to 15 years, specifically: 5 to 7, 10, 6 to 10, 10, 8 to 15, 10, 8 to 10, 10 to 15, 5 to 15, 10, less than 12 to 15, 10, 10 to 12, 10 to 15, a few years, 10 years, and 10 years. The above references present estimates for smart meter lifetimes in the range of 5 to 15 years (with 10 years being a good median value). The values come from a number of reputable sources, including industry experts, consumer organizations, utility consultants, and even utility managers when speaking outside the realm of large utility companies attempting to justify smart meter deployments as part of CBAs. Notably absent from the quotes above are smart meter manufacturers. Before I proceed further to demonstrate why smart meter useful lifetimes are likely less than 15 to 20 years, let me first attempt to show why many utility companies tend to assign the higher values. As we can see, the utility companies based their estimated smart meter useful life solely upon the word of the selected meter manufacturer Landis+Gyr. There is also an implication by the PSC that the utility companies may have purposely applied a 20 year value because it was the only way to arrive at favorable result as part of a cost benefit analysis. Utility reliance on manufacturer claims that smart meters should have useful lifetimes between 15 to 20 years or more. A bias towards wanting to rely on optimistic lifetime values in order to arrive at favorable results as part of cost benefit analyses (CBAs). A willful or naïve bias towards ignoring fundamental differences between traditional analog utility meters and solid state metering that introduce additional factors which reduce the actual useful lifetimes, namely, security risks and technology obsolescence. This “one study” stated that one component of an electronic utility meter, “an energy measurement IC” [integrated circuit], had sufficiently passed a “high temperature operational lifetest” to be able to achieve a 60-year life expectancy. Although this finding may be interesting to some, the paper itself recognized that the life expectancy of the meter itself (not one component) is a function of the life expectancy of each component in the meter as well as the overall design. The paper merely hypothesized that the results of testing this one component “brings us another step closer to accepting electronic energy meters as the energy meter of the future.” I find it disingenuous and deceptive that someone would reference this single study in a utility rate proceeding. Now let me proceed to discuss how smart meter manufacturers attempt to justify estimated smart meter lifetimes in the range of 15 to 20 years. As stated above, the utility companies typically rely on the claims of meter manufacturers for estimated useful lifetime values in order to develop their CBAs. 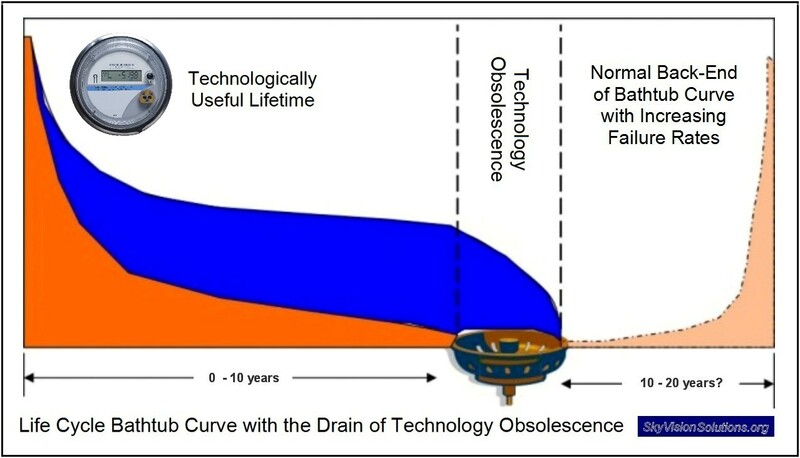 Reliability engineers model equipment failures with a bathtub shaped curve as shown. There are early life failures that may be due to poor installation or quality control issues; there is a steady state region of the curve where you have relatively constant random failures; finally, there is a point where “wear-outs” begin to occur at an ever-increasing rate signaling the end of the useful life of the device. “In response to your query regarding the expected life of the OpenWay CENTRON meters, the expected life is 20 years. In summary, the smart meter useful life values for most utility companies are based upon classical reliability analysis that models mechanical failure rates induced by accelerated life testing. From my analysis I saw no evidence that these values address security risks and technology obsolescence. In addition, there is some question whether the classical testing process adequately addresses communication chips and other accessory components of a smart meter such as LCD displays, weather seals, etc. Certainly communication-related equipment is not normally assigned a 15 to 20 year useful life in other industries. We have seen in this article that utility companies primarily base their estimated useful lifetime values on classical reliability analysis taking into account random equipment failures revealed as a result of accelerated life testing. There is some indication the results of such testing may not fully take into account all relevant components of a smart meter, but the results may still meet industry norms for such testing. More prominently, however, what utility personnel conveniently ignore is that the actual useful life for a smart meter is strongly influenced by other factors such as security risks and technology obsolescence. In some cases the transition to a newer technology may result from a desire for more functionality, but the transition may also be required due to the lack of technical or logistical support for the older technology. A recent example for smart meters was that some AMI meters deployed within the last few years were dependent on 2G cellular technology. With the phase-out of that technology, the utility is forced to replace the meters with a different technology that is still supported. Such an issue did not arise with traditional analog meters due to the simplicity of design that was not dependent on communications support. My article  in October 2015 regarding a possible smart meter life of 5 to 7 years was based upon one utility executive’s testimony at a Congressional hearing regarding cybersecurity for power systems. 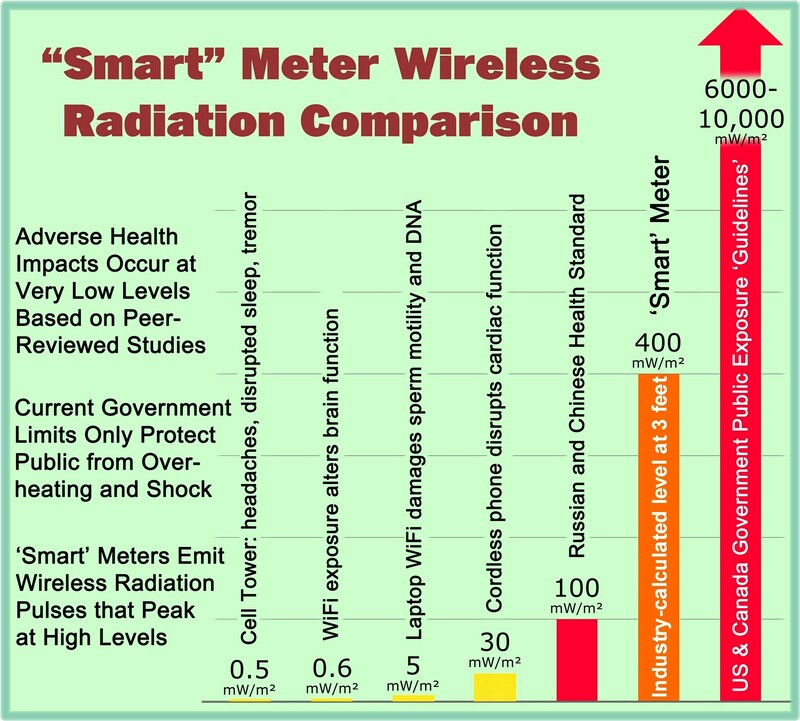 The context of the testimony was clear that cybersecurity threats have the ability to shorten the useful life of a smart meter as compared to the classical bathtub curve where end-of-life is solely dependent on wear-out failure rates. How could a cyber threat affect the useful life of a smart meter? All it would take is a serious cybersecurity threat being identified that could not be resolved through an “over-the-air” firmware update. The hope on the part of utility companies would be that over-the-air firmware updates would be able to successfully address security threats as they arise. To some extent this may be true, but it is uncertain. The use of over-the-air updates may extend the useful life of a smart meter beyond the 5 to 7 year time frame but probably not much past the ten-year point. Meter manufacturers and most utility companies attempting to justify large-scale smart meter deployments claim useful life values in the range of 15 to 20 years. These values are generally based upon the results of classical reliability analyses which are in turn dependent on determining when equipment failures begin to occur at increasing rates signifying end-of-life “wear-out” of the equipment. It would seem that utility companies ignore such factors as technology obsolescence due to bias, including wanting to use the higher lifetime values to more easily justify meter deployments, and “echo chamber” bias where one utility uses the same values as another peer utility had done in the past. There is also the possibility that utility companies truly don’t understand the fundamental differences between legacy meters and smart meters since it is not objectively credible that useful lifetime values for advanced meters would be solely based upon classical failures rates documented by meter manufacturers. In that regard, it is hoped that this article can shed some light on this most important issue. In short, utility companies need to do a better job of considering security issues and technology obsolescence and how these factors shorten the estimated useful lifetimes of smart meters. Public utility commissions also need to better educate themselves on these issues, so they don’t improperly approve meter deployments that are in fact not reasonable or cost-effective. 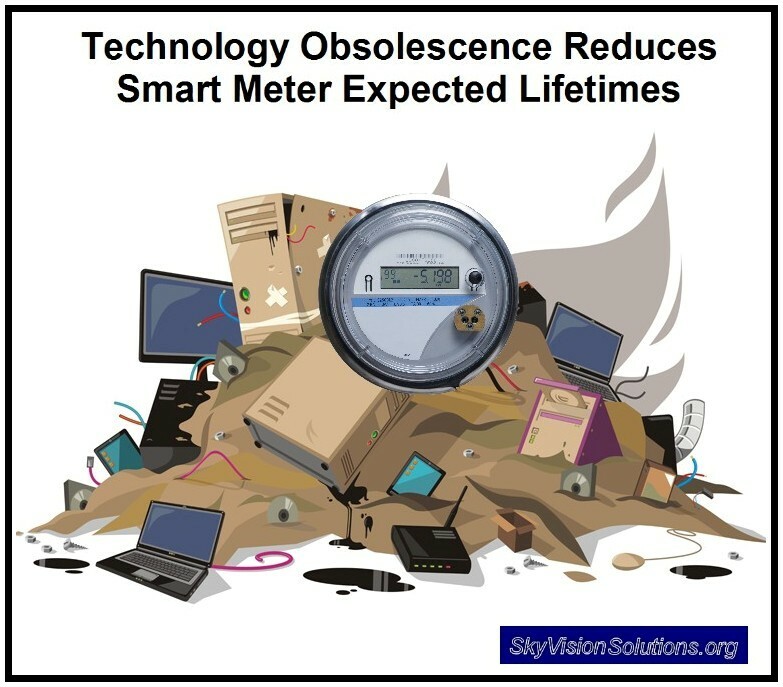 Based upon the information and evidence presented in this article, it is clear that security issues and technology obsolescence reduce the estimated useful lifetimes of smart meters as compared to solely considering classical reliability analysis. It is recommended that useful life values for smart electric meters not be assigned values exceeding 10 years. Utility companies planning to deploy smart meters in the future should adjust their project plans and CBAs accordingly. At the very least, utility companies should be required to specifically identify how their estimated useful lifetime assumptions used in cost benefit analyses have addressed the effects of security issues and technology obsolescence. Is 15 years a sensible target for smart meter lifetimes? Editor’s Note: When articles at SkyVision Solutions are published, efforts are made to preserve links for future retrieval and reference, either through direct linkage to this website or through saving the links at http://archive.org/web/. Should you find that a link in the future is not valid or is outdated, please check for an archived version of the webpage or document. For example, regarding depreciation schedules, an IRS Memorandum  issued in 2012 acknowledges the technological nature of smart meters as “information systems” and would appear to allow utilities to depreciate certain types of smart meters in the U.S. over a period of 5 years for tax purposes. This type of information supports a claim that smart meters likely have useful lifetimes less than 15 to 20 years but does not prove it technically. For business case purposes the true benefit period for a device does not always match its tax depreciation schedule. In some cases governments allow accelerated depreciation schedules as a form of tax incentive for businesses to invest in equipment deemed desirable to support government policy objectives. This entry was posted in Smart Grid, Smart Meters, and RF Emissions and tagged Costs, Cyber Threat, Smart Meters, technological obsolescence, Useful Life. Bookmark the permalink. Aside from the technological obsolescence angle, even a 20 year service life for the hardware alone is very optimistic, if not out in out dishonest. Three reasons: (1) All electronic digital meters have a rechargeable battery inside, such as a lithium polymer type, the purpose of this is to keep the memory intact when the power goes out. The life span of these batteries is between 5 and 8 years, this is leaving out environmental factors such as heat, cold, lightning, or system issues such as power surges. and theses can very wildly depending on the model of capacitor, the manufacturer, and the country of origin. A few years ago, from about 2005-2010, there was a phenomenon known as the “capacitor plague” where poor quality, and even counterfeit branded electrolytic capacitors were flooding the market from China, working their way into thousands of consumer electronic devices. This was why people had three year old LCD screen TVs and monitors that would refuse to turn on, or similar aged computers with failed power supplies and motherboards. Even though the counterfeits have largely been weeded out of the supply chain, cheap, poor quality capacitors are still being manufactured, by the same parties. Guess which company supplied Itron with electrolytic caps for their meters? It wasn’t Sprague, or Panasonic, or Nichicon, it was Lelon, which is only one knotch above the Chinese mystery brand caps that routinely bulge, and fail. (3) There is a certain preoccupation in the modern electronics business to build equipment with multi layered, printed circuit boards, as opposed to the traditional type with one or two sides at most. In constructing electronic devices this way many, if not most of the components end up being surface mounted to foil pads on the board. Now in a controlled environment, such as inside a personal computer, in a home or business, this is not usually an issue, however most electric meters are mounted on the outside of buildings, in the heat, cold, and the weather. Printed circuit boards, components, and solder comprise dissimilar materials, copper, lead, plastics, tin, gold, and all react differently to heat, cold, moisture, which can cause these surface mounted solder joints to break down over time, even faster with lead free solder. (4) To be in service outside the boards in these meters should be potted, that is coated in a weather resistant coating, this would be routine in automotive electronics, but is non existent in many digital meters, at least the Itron models. To make matters even worse, the meters that Itron produces are not even weather tight, there is no gasket between the plastic dome, and the base of the meter, if there is a lot of rain, or slushy snow, you can see condensation, and sometimes standing water inside the meter housing. How can any electrical device be expected to live out a 20 year lifespan whist being infiltrated by water for several months out of the year, the answer is that they can’t, things will oxidize, corrode, and inevitably fail. Thanks for your information and feedback. Most of what you say may be true, but I know of several models of solid state meters that do not contain batteries. Some basically have a flash memory that stores the current memory upon power failure. Those meters that are part of a mesh network maintain time as synchronized through the network communications. Those meters capable of outage notification many times contain a supercapacitor (in lieu of a battery) which powers the meter just long enough to get out a last gasp notification. I’m speaking of the Itron Open Way dumb “smart” meters in particular, there are no supercaps in those, and they use a mesh network. When the power goes off where I am, it usually goes off for at least three hours at a time, without the battery they would pretty much loose their memory. The last gasp would not work as the usage data is only collected twice per day, (I’m not speaking of the meters communicating with each other, just between the meters and the power co. office in my area) which takes about 4 hours each time, and if the whole network is dead there isn’t any place for it to go. From what I can see Itron is a company run by bean counters, not engineers, which is not surprising given that they were built through acquisition, if they can save $.005 cents per meter they will do it. These are guys that won’t even install gaskets between the dome and the baseplates of their meters, if a flash drive or a good quality supercap costs more then a battery, the battery wins. You should see what their rates of pay are for engineers, they start at $40k and top out at $60K, one thing’s for sure, the best talent isn’t looking there for work! I have no idea which companies would add the backups you speak of, G.E maybe? Actually I had more then three reasons why their life will not anywhere near 20 years, I had five but only remembered to jot down four. The fourth reason is the serge protectors that many use, if they use a metal oxide varistor or MOV type serge protector, those have a service life as well. If they are in a region that receives a lot of lightning strikes and power surges, the MOV is damaged slightly each time. After a certain period of time the MOV wears out, no longer dissipate the surges, overheats, shorts out, and burns up. There was a problem with these that surfaced a few years ago in serge protected computer power bars, the MOVs would wear out, short, burn up, and light the plastic of the power bar on fire. The MOV in an Itron Open Way meter is mounted right to one of the circuit boards, NOT smart! Many older smart meters certainly contain batteries but I would say that most newer ones don’t. When you have “flash” memory, the memory (and stored data) is not lost when there is a power loss. The meter will lose track of current time but that is re-established with the network when power is resumed. As part of my article in 2015, I included the Congressional testimony of one corporate officer referring to a 5 to 7 year lifetime. The person did not fully explain his rationale for his statements, but it is likely that he would say for cyber threats “over-the-air” firmware updates could extend the life of the smart meter to some extent, i.e., by a few years. The guy was after all speaking at a hearing on cyber threats. I am sure he did not mean that all his company’s meters were going to fall apart or stop working after 5 to 7 years. This is a more complex issue than that. For this latest more comprehensive article I spent nearly a year collecting the source information and references. I averaged the values from about 20 different sources to arrive at the 10-year number (from what I judged objective sources). The Congressional hearing statement reference for a 5 to 7 year lifetime is one of those objective sources used in this latest article. To just claim the 5 to 7 years lifetime number or maybe even less is more realistic as a general characterization is not really plausible. I have had a smart meter on my home now for over 5 years as well as everyone in town; there is no great rush to yet replace them. But the issue is the high risk of obsolescence within about 10 years or so from deployment and that is really what this new article is about. The conclusions reached in the above excerpt are consistent with the results of my year of research on this topic of smart meter lifetimes.